Abu Layla al-Athari said, “Shaikh al-Albaani was with [his wife] Umm al-Fadl in his car and stopped next to a watermelon stall, and Umm al-Fadl, as normal, got out since she, it seems, knew about them [i.e., which ones were good to buy etc.]. Also see here, here and here. Shaikh al-Ubailaan said, “… and this methodology which the scholars, may Allaah have mercy on them, have determined [concerning hadith] and [also] which the people of knowledge are upon concerning hadith is what the Ameerul-Mu’mineen in hadith of this age [i.e., al-Albaani] is upon, for he is the reviver of [both] the Science of Hadith and the Sunnah in this time—as the scholars of this age have stated openly—yet he did not bring anything new [i.e., unfounded], additionally he didn’t accept being a blind follower of anyone else in a field of knowledge to which he had devoted the majority of his life, and Allaah granted him things in that field which He didn’t grant others, and his goal in it was to aid the Sunnah, he didn’t busy himself with it in order to make a particular madhhab triumph, or to seek the dunyaa, in fact, he split with his father when his father gave him the choice to agree with him in something he was opposing the Sunnah in or to part ways, so he chose to part ways, saying to his father, ‘Give me three days in which I can seek Allaah’s Guidance in this matter [istikhaarah],’—and at that time he had no worldly possessions, Shaikh [al-Albaani] told me this himself, may Allaah grant him a place in the highest Firdous and raise his rank among the rightly guided. So the Shaikh spent his entire life in this struggle, he didn’t seek knowledge in order to live in the lap of luxury, or to gain fame and the people’s praise—rather his concern was to spread the Sunnah, whoever was pleased with that then so be it and whoever raged against it, then so be it. And no-one recognises the merit of the people of excellence apart from [other] people of excellence, yet despite that we do not claim that the Shaikh couldn’t make a mistake when declaring something to be authentic or weak, this wasn’t the case and nor will it be with others. Raddul-Jameel fidh-Dhabb ‘an Irwaa’ al-Ghaleel, pp. 67-68.
because there is no doubt that the verses which Allaah جل ثناؤه makes precise are those of His Revelation, based upon this it is known that what Shaitaan threw into them is what He تعالى ذكره said He abolished and nullified, and by annulling them He made them [i.e., His verses] precise. This is the noble verse’s intended meaning and it contains, as you can see, nothing except the fact that at the time of the Prophet’s recital ﷺ the Devil throws forward that which causes those in whose hearts is a disease to be put to trial. But nothing satisfies the enemies of the religion who sit in wait at every path and lurk in the shadows at each and every place of ambush against it, except to thrust into it things that aren’t from it, and which His Messenger did not say. And as you will soon see in the forthcoming narrations, they mentioned that which is not becoming of the rank of Prophethood and Messengership—and that is their habit of old. Just as they did with more than one verse concerning other Prophets apart from him ﷺ like Dawud, Sulaimaan and Yusuf عليهم الصلاة والسلام, where when explaining the verses about them they reported Israiliyaat narrations which it is not even permissible to attribute to a [regular] Muslim let alone a revered Prophet, and this can be seen in the relevant parts in the books of tafsir and stories. So beware, O Muslim, of being deceived by any of that and as a result ending up amongst those destroyed, and, “Leave that which causes you to doubt for that which does not cause you to doubt,” as your Prophet ﷺ said. 1 See the Al-Maktab al-Islami and Daar al-Khaani prints, checked by Dr. Muhammad Afifi, 2nd edition, 1/150. And may Allaah send praise upon Muhammad, who Allaah the Most High gave power to over Iblees such that he was almost about to strangle him to death, and he had intended to tie him to one of the pillars of Medina’s Mosque2, and [may He also send prayers] upon his family, Companions and whoever seeks guidance by following him up until the Day of Judgement. A scholar from our dear brothers in Pakistan who was sent there for some academic purpose wrote to me on 14/7/1952 asking for my opinion concerning the hadith of the cranes [Gharaaneeq] about which two great Haafidhs, Ibn Kathir the Damascene and Ibn Hajr the Egyptian, differed, the first rejected it and the second declared it to be a strong hadith; and he requested that I not refrain from giving him an answer. So I spent some months waiting for the opportunity to be able to respond to his request. After the Eed al-Adhaa prayer this year, 1371 AH, a beloved brother met me and then also asked me about the hadith of the Gharaaneeq, thus I answered him telling him that it was not authentic but rather false and fabricated. He then mentioned a youth to me, someone in whose heart is a disease, who used that hadith to show that the Prophet ﷺ used to—and far be it from him—say things to please the polytheists to draw them to himself, because according to this youth’s false assumption he was not a true Prophet but only pretending to be one in order to take a position of authority over them, a point some of the infidels of times past and present used to praise excessively without reason. “The Day when there will not benefit [anyone] wealth or children. Indeed He is the All-Hearing, the All-Knowing, the Most Beneficent, the Most Merciful. Damascus, on 2/1/1372 AH, 21/9/1952. 2 This has been reported in Sahih al-Bukhari, 3/62 in Ibn Hajar’s Sharh, Muslim 2/72 and others. See here for the second part. 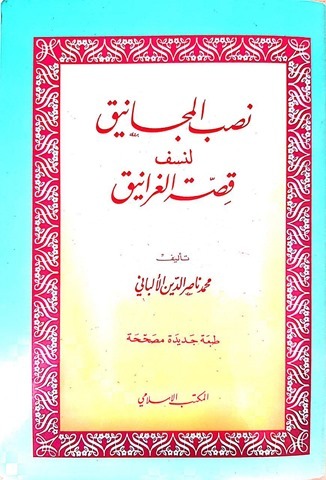 Saheeh al-Jaami, vol. 1, p. 330, no. 1590. The Imaam said, “And so here I am, having spent my youth’s vigour, the vitality of my middle age, whatever remaining strength I have in my old age, and the greater portion of my free time in the service of this [most] noble knowledge, with an acute craving for examining manuscripts and photocopies [of books], let alone actual printed ones—hardly anything preoccupying me from that as it does other students of knowledge, except for what I have no choice over. Questioner: A man who was disobeying Allaah, very rich, then some years later he repents to Allaah, does he have to pay the zakaah of the previous years? Questioner: Okay, regarding zakaah, maybe the answer will become clear with this question, a man never gave zakaah for many years, then he repented and turned back to Allaah and wanted to give zakaah, so naturally, it is waajib for him to give the zakaah [for those years]? Questioner: But he had agricultural land, and he doesn’t know how much it yielded, he’s forgotten, so how much zakaah is he to give? Al-Albaani: According to the best estimate [he can make], as is the case with all matters that are unclear like this, he makes the best estimate he can, he calculates an amount, he strives, ya’ni, [to come to the best estimate he can], there is no specific amount that has been set. Questioner: A man stayed seven years, his wife has a lot of valuable gold, this ornamental gold, he doesn’t know what the ruling is, for seven years he didn’t pay the zakaah? Al-Albaani: He pays the zakaah for those seven years even if [in the process] he were to lose all his house. Questioner: Is the hadith, ‘Fast and you will be healthy,’ authentic? If it isn’t how so? Al-Albaani: This hadith differs totally from the one we mentioned before it, that last hadith about which we said that its chain of narration was weak and [along with that] the text itself was untrue [as well]. This hadith [however] is weak in terms of its chain of narration but correct in its meaning, ‘Fast and you will be healthy,’ as a hadith reported from the Prophet ﷺ according to the scholars of hadith its chain of narration is not authentic, but the state of affairs shows, and, before that, general hadith like his saying ﷺ, ‘It is enough for the Son of Adam to eat a few small bites that strengthens his spine. If he must have more, then let him fill a third with food, a third with drink and leave a third for his breathing,’ … so hadiths like this confirm, and as occurs in another hadith which has no basis whatsoever but which does contain fine wisdom, ‘Prevention is the best cure, and the stomach is the home of disease,’ for this reason, this hadith, ‘Fast and you will be healthy,’—its attribution to the Prophet ﷺ is not correct but, due to what we mentioned, its meaning is. So it is not allowed for a Muslim to say a sentence, even if in and of itself it is a piece of wisdom and is acceptable in the view of other general, legislated proofs, [yet] it is [still] not allowed for a Muslim to say, ‘Allaah’s Messenger ﷺ said,’ unless it has, according to the scholars of hadith, been confirmed through the ways which establish the hadiths of the Prophet ﷺ.
Ad-Da’eefah, vol. 2, pp. 336-337. Al-Albaani: Another Ramadaan has come round and you haven’t made up for the [Ramadaan] fasts you missed from the previous year? There is no harm in that, [but] you should begin making them up at the first opportunity that arises, even if many Ramadaans have passed you by. But if he isn’t quick, then, firstly, that doesn’t take that obligation away from him, so he must [still] make them up, and [secondly], he doesn’t have to do anything more than simply making them up. The Imaam said, “It has been related from the Prophet ﷺ that he said, “There are three people who will not be called to account regarding what they eat, as long as it is halal: a fasting person, and the person eating the suhoor meal and the one guarding the frontier in the way of Allaah.” [Hadith grading:] Fabricated. The Imaam said, “And maybe one of the bad effects of this [fabricated] hadith is the [resultant] state of the Muslims today—for when they sit to break their fast in Ramadan, a person won’t know to get up [and step away] from the food except just before Ishaa due to how many various types of food, drink, fruit and desserts he devours! And how can this not be the case when the hadith says that such a person is one of those who will not be called to account over what he eats! So due to that they combined the excessiveness which one has been prohibited from in the Book and the Sunnah with the delaying of Maghrib which has [also] been prohibited in his saying, “My nation will remain in good …” or he said, “… upon the Fitrah, as long as they do not delay Maghrib until the stars appear.” (Al-Haakim declared it to be authentic and adh-Dhahabi agreed with him and it is as they both said, for it has other paths and supporting proofs which I pointed to in Saheeh Sunan Abi Daawood, no. 444). An encouragement to hasten in opening the fast has also been reported in many hadiths, like, “The people will continue to be fine as long as they hasten the opening of the fast.” So both hadiths must be implemented in a manner where one doesn’t negate the other, and that is done by starting iftaar with a few small bites of food by which one’s hunger is calmed down, and then he gets up to pray and then, if he wants, he can come back to the food until he fulfils his need therefrom.